Watch this incredible video of an octopus squeezing it`s giant body through a tiny hole to perform an astonishing escape from a deep sea fishing boat. This octopus was caught up in the nets of a fishing boat and the crew watched on in amazement as it made an escape even Houdini would be proud of. This video was filmed by Chance Miller during a fishing trip near the Chiswell Islands in Alaska. It is common for octopuses to get caught up in fishing nets and are usually thrown back in the sea but this fella wanted to make his own way back into the cold Alaskan ocean. 1. The octopus only has a five year lifespan. 2. The Pacific octopus can squeeze through any opening that is larger than it`s beak as proven in the video above. 3. Did you know that octopuses have three hearts. Two of them are used to pump blood to both lungs and the third supplies blood to the rest of the body. 4. Octopuses have amazing healing abilities, they can regrow an arm in just six weeks. 5. The Pacific octopus is the largest of the species. One of the biggest ever encountered was measured at an incredible 30 feet across! 6. Some octopuses are cannibals and eat members of their own species. 7. 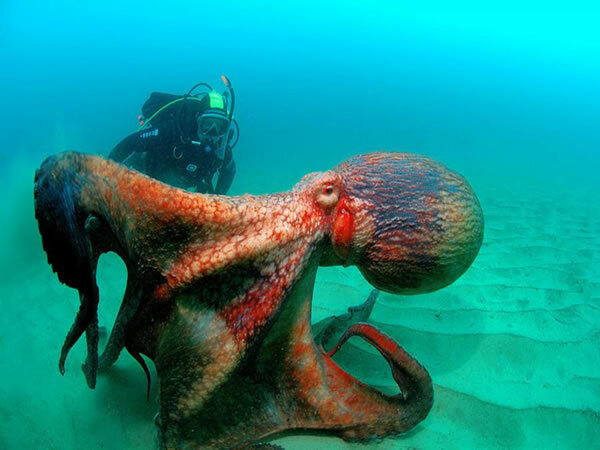 Octopuses have been found to eat their own tentacles when bored. This weird behavior has been witnessed on numerous occasions with octopuses in captivity. It`s a good job their tentacles grow back. 8. Octopuses are very intelligent creatures and are one of the few animals on the planet that have learnt to use tools.